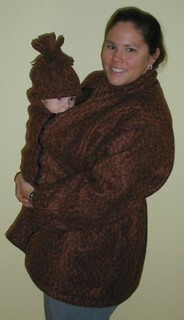 This jacket has slashes in the underlayer to allow for nursing, and there is an optional zip in panel, pictured to the left, to turn the jacket into a “Mama’s Coat”. They were very easy if you read them with care. It’s a little tricky getting the overlayer on straight. It’s easy to sew, and it makes a functional jacket. 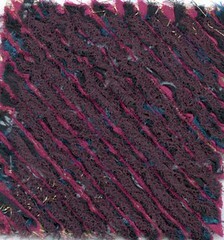 Fabric Used: Cheetah patterned fleece. I recommend it to others who want a jacket with nursing access. I have used it that way when exercising, and it kept me from getting chilled while nursing outside. I’ve carried my daughter in a sling in the jacket using the panel. I was wearing a heavy wool sweater under the jacket and DD was wearing a sweater and warm jacket. We were out in 20 F weather, and neither of us got cold. I probably won’t make it again. It’s not like I need a closet full of jackets like this, and this pattern doesn’t inspire me to make wearable art like some jacket patterns do. Conclusion This is a very functional jacket for a mother. Pattern Description: This is a nursi ng top designed where you lift the overlay to nurse. 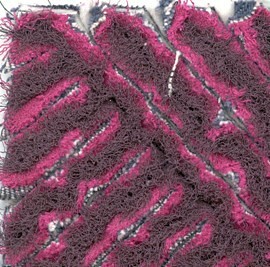 The underlay is a center piece with large holes at the arm allowing for nursing access. IMHO, this is the best design for nursing access on this sort of top, much better than slashes over the breasts. This pattern is very easy to sew, and because you can use the overlays from NC 107 and 207 as well as 307, you have lots of options. 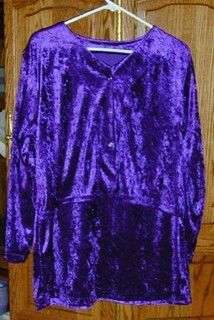 Fabric Used: Purple panne. 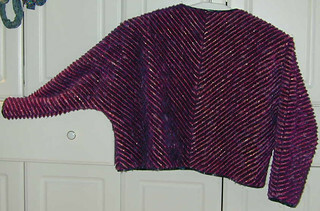 This was the second garment that I attempted out of panne. I’d been unsuccessful making a NC205 out of panne, but after asking for help from various online sources, I was able to succeed with this top. I know I lengthened the overlay by 2 inches so that it would reach my waistband, and I lengthened the underlay by 2 inches so it would stay tucked in, but I can’t remember if I altered the nursing access holes. Usually, I have to lower and lengthen them. Would you sew it again? Would you recommend it to others? Absolutely. Conclusion This is a nicely designed top. Update I made another jacket for the Stash Contest. This time I made the jacket in XL instead of grading up. I probably could use a little more room thru the bust, but it does close. 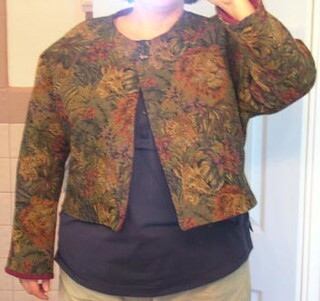 I made the jacket out of a tapestry fabric that I bought online more than a year ago to make this pattern, and I lined it with a chamois that I purchased at a going-out-of-business sale at a Joann’s. This pattern is very simple, and that makes it a good one for beginners, but the tapestry fabric is very ravelly, and I’d reommend that a beginner choose a more stable fabric or a pattern with larger seams. I had to use fraycheck in a couple of places along the seams. This time, I followed the instructions. I think they were very good. I’ve lined jackets before, but this time it was so easy. The words in the instructions were clear and the line drawings were wonderful. I wasn’t confused at all, and that is a first for lining a jacket. I interfaced the entire jacket front and back instead of just alone the fronts and neckline. This helps stablize the tapestry fabric and will cut down on ironing in the future. I edge stitched the jacket, except at the cuffs. I haven’t decided how I want to finish them. I ironed one so that the lining didn’t show. I hand pressed one so that the lining looks like big piping. I tried the jacket on with the cuffs rolled up like on the pattern. I’m leaning towards the big piping look, but if not, I will have to edge stitch the cuffs, too. Dolman sleeves aren’t my favorite for appearance, but I think they pretty good on this jacket. Dolman sleeves are my favorite for ease of construction. 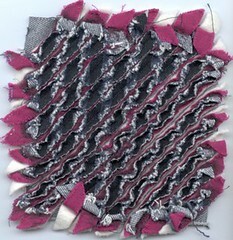 This pattern is a great showcase for a funky or unusual fabric. I’m very happy with my new jacket. I even got to use a funky cat head button on it. I can’t wait for it to cool off. If you want to whip out something cool in a very short time, this is a great pattern. 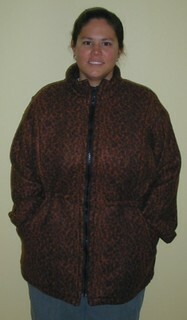 Pattern Description: This is a very simple dolman sleeved jacket. Without the interfacing pattern pieces, there are only 2 pattern pieces. Pattern Sizing: The pattern is true to size. Did it look like the photo/drawing on the pattern envelope once you were done sewing with it? Pretty much. I made an unlined faux chenille jacket instead of a lined jacket, so I didn’t expect my jacket to look exactly like the pattern picture. Were the instructions easy to follow? Since my jacket was unlined, and I didn’t use interfacing, I didn’t really follow the instructions. The ones that I did use were easy to follow (sew the back seam, sew the shoulders, sew the side seams). What did you particularly like or dislike about the pattern? Could a pattern be easier? Cut out the fabric, sew the back seams, sew the shoulders and sides, sew the 2 sides together, turn, and slip stitch shut. Viola! a jacket! This pattern has so much potential for fashion fabrics and for wearable art. 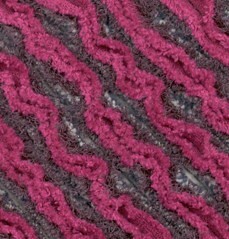 Fabric Used: I used faux chenille that took frigging forever to make. Pattern Alterations or any design changes you made: No lining. I made bias tape to bind the edges. And I made mine in an XXL (simple to grade up or down to XXS), which is one size bigger than the instructions call for, but my jacket is going to be substaintially heavier (base layer heavy denim, 5 layers of rayon for chenille) than a reversible jacket out of 2 light to medium layers. Also, if I were making a reversible jacket out of a quilting cotton or rayon or something like that, I would fully interface one side instead of just interfacing portions. You have less ironing to do, and the jacket stays crisper. I didn’t do this because my jacket isn’t lined, and I don’t think denim needs interfacing. I used snaps instead of buttons for the closure. Would you sew it again? Would you recommend it to others? I plan on making this jacket out of tapestry fabric with chamois on the reverse in the near future. I highly recommend this pattern. It would be a great pattern for a beginner, and I think it’s excellent for wearable art or for showing off really cool fabrics, like the afore mentionned tapestry. Conclusion After wrestling with the chenille fabric for so long, this jacket was a joy to make. It’s so simple. It goes together quickly, and it looks great on. 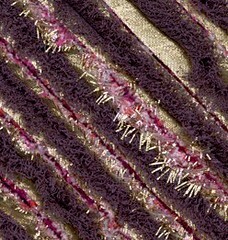 You can see a picture of the back and a discussion of the faux chenille process at Chenille Jacket. After I had my baby, I had a hard time finding nursing tops that fit. Hah! I had a hard time finding nursing tops, period. Nursing a baby is difficult enough without struggling to keep your clothes out of the baby’s way and not fully exposing your breasts. Tops with nursing access make all the difference. 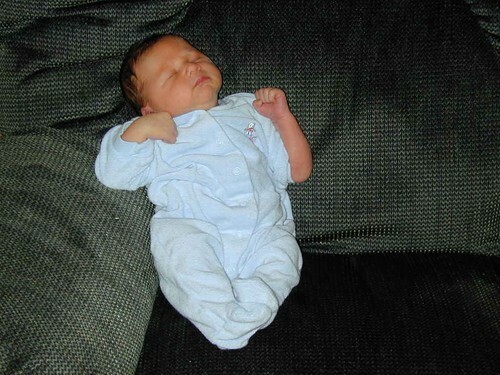 One of my books on attachment parenting recommended The Nursing Mother’s Sewing List (NMSL). I found the e-mail list to be very helpful and informative. The people on the list are warm, friendly, and inclusive of all who join. It’s a chatty list, and they do, occasionally, drift off topic. Before I joined the list, I had made a few outfits, but I found the process to be frustrating. The sewing machine is my friend, and I’ve been quilting since about 1988, but sewing clothing was just too hard when I could go out and easily buy what I liked. Since nursing tops were few and far between, in general, and practically non-existant in my size (42G bra right after Isabel was born, and now a 40DD), I decided with much trepidation, to attempt sewing clothing again. With the help of the people of NMSL, I have been very successful. 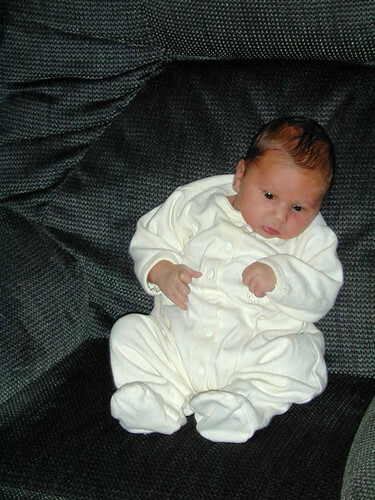 The image above is an Elizabeth Lee Design, specifically Nursing Classic 205. Everytime I wear this shirt, I get compliments on it. I combined 3 different woven cottons: the front overlay and back is a multicolored, hand-dyed-looking fabric, the front underlay is gold stars on the green fabric, and the sleeves are gold trees on the green fabric. I attempted to make another NC205 out of panne, but panne is stretchy and slippery, and I could not get the overlay and underlays to hang straight (probably because I stretched and distorted the fabric when I was cutting). I gave up on this top and strongly recommend that beginners not make the 205 out of a stretchy, slippery fabric like the panne. However, I did make a panne top from Nursing Classics 307. It is featured above. This pattern is much better suited for panne for the beginning sewer. I have also made the original Nursing Classic 107, not the updated version featured at ELD website. I prefer the nursing opening of the 205 and the 307 over the openings in the 107. However, you can use the 107 and 207 overlays with the 307 underlay. 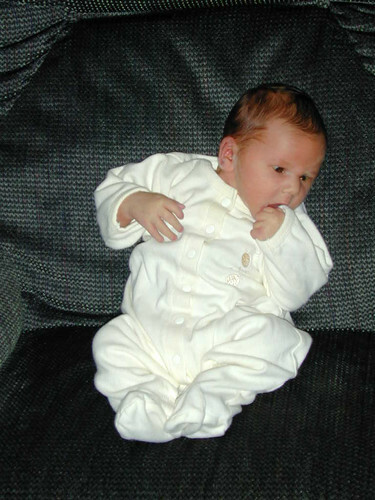 I wrote a review of Nursing Classics 206, Coat for NMSL. The picture above left shows the coat with the “Mama’s” panel zipped in. The picture above right shows the coat without the panel. I did not use the panel very much. I did use the nursing openings. 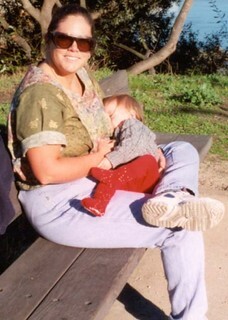 They worked great when I had to stop exercising (and was still all sweaty) to feed Isabel. Without the coat on, I would get chilled. 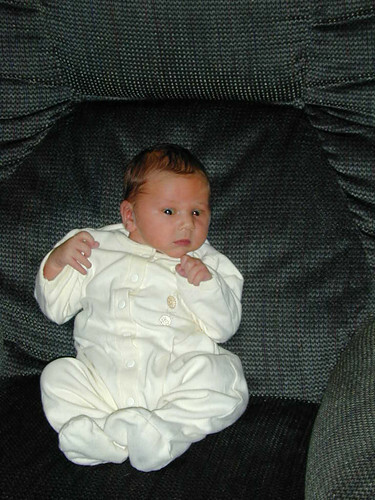 I have some tips and hints that I have saved from NMSL and other sources at my Nursing Mothers Sewing List Tips page. There are also crafting hints and tips. 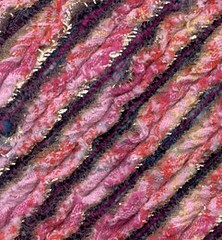 I have Variations In Chenille by Nanette Holmberg and her second book on chenille, New Directions in Chenille. They are both very inspirational, but I didn’t find very much new information in NDiC, and now that Ms. Holmberg has her patterns on her website, unless you collect books for their own sake, I don’t recommend that you get both books. I had problems with thread breakage, probably, because I wound a plastic bobbin too tight. The bobbin thread stretched and the plastic bobbin wasn’t strong enough to stand up to the pressure placed on it by the stretched thread. 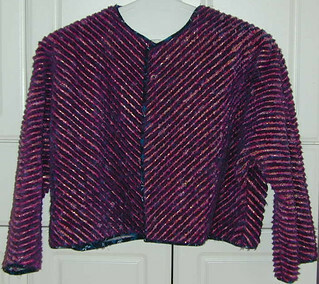 Anyway, if you do a chenille jacket, be very careful in checking for broken threads. When I pulled this one out of the dryer, I had to make repairs which were made more difficult by the fact that I didn’t have all of the fabrics from the stack. It also helped that the rows that broke had back stitches in them, so only short sections of the stack came loose. I repaired the jacket by cutting half inch strips of bias and hand stitching them down. I used a wire brush to fluff the repairs. I think I was very successful. You can’t see the repairs unless you closely examine the jacket. If you scroll down, you can see the samples that I made before constructing the jacket. 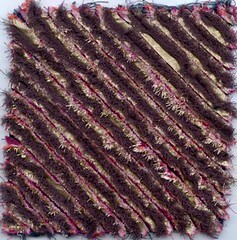 I agree with ViC that it is very important to make samples before making the chenille for a garment. 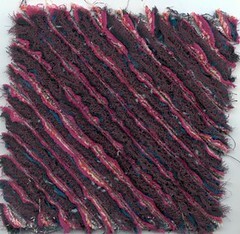 Making a chenille garment is a major time commitment. It’s also very boring sewing all those rows. 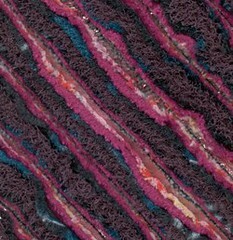 I doubt that I will make an entire garment from faux chenille again. No interfacing. The base layer is a heavy denim which I don’t think needs interfacing like a light or medium weight fabric, and I didn’t line the jacket. Because there was no lining, I had to use bias tape to bind the edges. I made the tape from the teal fabric that I used in the stack. I use snaps for the closure instead of buttons as called out in the pattern instructions. You can see the lower snap in the picture of the jacket front, but I was successful in hiding the upper snap under the chenille. I wanted to use fabrics exclusively from my stash. In ViC, it says that both denim and Warm&Natural are effective in a chenille stack. I happened to have quite a bit of a striped denim and Warm&Natural. Sample 1 (above) This is the first sample that I made. 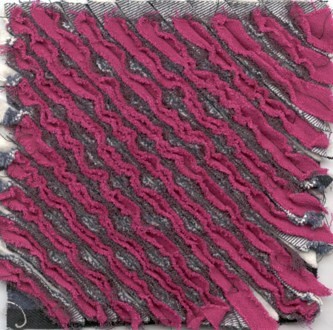 From top to bottom, it includes a purple gauzy rayon, a fuschia rayon, a stiped denim with the stripe up, and Warm&Natural on a denim base. I did not find this to be satisfactory. Although, in hindsight, it was the best of the first round of samples (1-3). 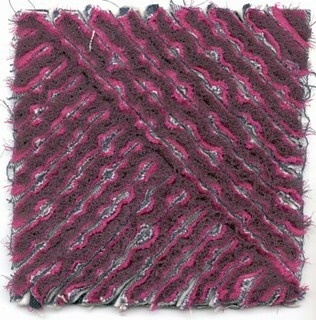 Sample 2 I switched the purple and fuschia rayons, and I turned the denim stripe down. I decided that I liked the purple on top. 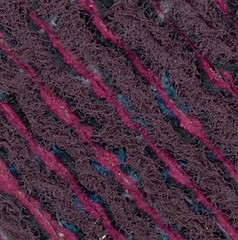 The purple rayon frays very nicely, but is so lightweight, that it get obscured under heavier fabrics. The denim fluffs better in this orientation. Sample 3 I did a sample with the denim on top. Even though I knew I wasn’t going to make a jacket with the denim on top, I wanted to know how it was (not) fluffing. The painted stripe on the denim clearly inhibits fluffing. At this point, I decide to reread ViC. I realize that I had misunderstood the directions. I thought that 5 layers total including the base was the recommendation. Instead, it is 5-6 layers plus a base fabric. After discussing this with the Wearable Art Plus mailing list, I decided to add tissue lame, from my stash, to the stack, drop the Warm&Natural, and add 2 fabrics, yet to be purchased. Sample 4 From top to bottom, purple rayon, gold lame, pink plaid cotton, fuschia rayon, and dark teal rayon, denim with stripe down, on denim base. The gold lame did not fray in the dryer. I had to work each row by hand. You can see the difference very clearly in the detail view to the right. I decided that I didn’t like having the lame that dominant in the stack, and I didn’t like having to work each row by hand. Sample 5 Just for kicks, I did a sample with the cotton plaid on top. It’s interesting, but I think for the cotton to work on top, the rows need to be 3/8 of an inch apart. Mine are 1/2 inch apart. Sample 6 From top to bottom, purple rayon, teal rayon, fuschia rayon, pink cotton, and pink lame on a denim base. There may be a layer of denim in the stack, but at some point, I decided to drop it from the stack and only use it on the base. I’m not sure why this didn’t fluff as much as the next sample. Sample 7 From top to bottom, purple rayon, teal rayon, fuschia rayon, pink cotton plaid, and pink lame on a denim base with the strip down. 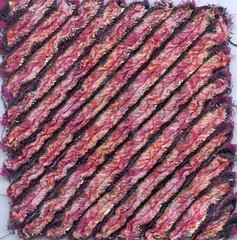 I decided to throw caution to the wind, and make the jacket without making a test square with purple rayon, teal rayon, fuschia rayon, pink cotton, gold lame, on a denim base stripe up. Pulguito was born on Dec 31st, 2002. 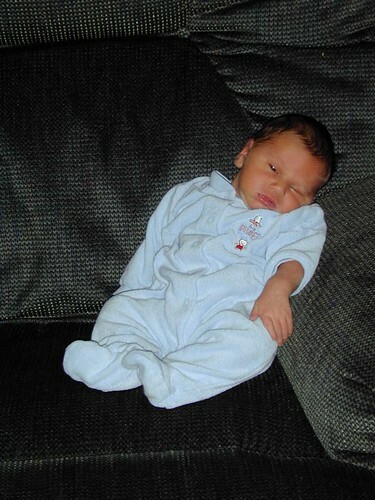 He weighed 8 pounds and was 20 inches long. That’s right. He grew 2 inches in 2 weeks.